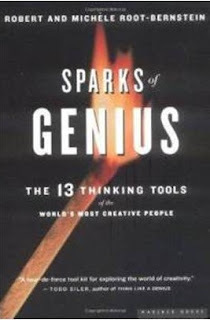 BOOK REVIEW: "Sparks of Genius"
In Sparks of Genius, the Root-Bernsteins posit a strong case for brilliance manifesting itself in specific mental and physical activities that we can cultivate. Their exhaustive research and engaging stories suggest the J. S. Bachs, Anton Chekovs, Noam Chomskys, Albert Einsteins, Martha Grahams, Helen Kellers, Mary Leakeys, Vladimir Nabokovs, and Pablo Picassos of today or any era possess many or all of thirteen thinking tools. The authors systematically dedicate one chapter to each of these abilities: observing, imaging, abstracting, recognizing patters, forming patterns, analogizing, body thinking, empathizing, dimensional thinking, modeling, playing, transforming, and synthesizing. They conclude with a powerful appeal to the educational system for providing environments, curricula, instructors, methodologies, and materials that elevate the arts, cross all disciplines, encourage creativity, and foster invention. Reading this book is like surveying the history and the future of innovation. BOOK REVIEW: "The Talent Code"
Does practice make perfect? I have often wondered about the truth of that aphorism. A brief look at any physical or intellectual endeavor shows that some people seem to practice just as hard as accomplished performers without achieving anywhere near the same level of mastery. 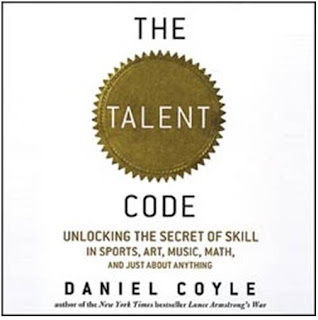 In The Talent Code, Daniel Coyle argues that practice does perfect, provided that it is the sort of "deep practice" that triggers myelin, which is the material that wraps around the axons in the brain and is believed to be the source of mastery. As Coyle puts it, myelin trumps social prosperity, peace, freedom, mobility and paradigms. Deep practice fires impulses that strengthen myelin. It is no wonder that Florence of the late fifteenth century developed many of the greatest artists ever, Russia maintained a monopoly on the chess world for the latter half of the twentieth century, and the Dominican Republic produces more major League baseball players per capita than anyplace else. Their common denominator is an environment and coaching regimen that systematizes practice into appropriate, repeatable steps, which develop skill circuits to the point that the learners are unaware they're using them. The three steps to deep practice detailed in The Talent Code are "chunking" by absorbing the whole skill and breaking it into small parts, repeating the activity, and "feeling" it. Coyle strongly suggests that learners cannot achieve mastery alone; rather, they need master coaches who can teach the required skills on infinitely deeper levels, perceive the learner's uniqueness, know the path to take for individual learners (what Coyle calls the GPS reflex), and point out learner errors honestly and memorably. This book may well be one to which educators across the country will refer in reforming education, especially on the elementary level. 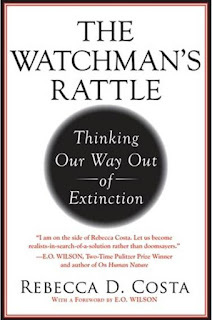 BOOK REVIEW: "The Watchman's Rattle"
Have we humans confronted problems that have not yet learned to overcome? Have we exacerbated these problems? Can these problems lead to the demise of the race? According to trendist Rebecca D. Costa, the answers to these three questions are yes, yes, and yes. With great authority and credibility along with exceptional writing style, Costa muses about the decline of three magnificent empires, the Mayan, the Roman, and the Khmer. They existed in three different eras and in three different continents, spoke different religions and languages, and had different climates. They all achieved remarkable architectural and engineering feats which sustained their civilizations for centuries. They experienced unprecedented cultural, commercial, and agricultural renaissances that enriched their cultural immeasurably. Then what made them collapse? Costa believes they shared a common human flaw: cognitive threshold, which occurs when a society cannot think its way out of its problems, be they foreign military threats, famine and drought, or cataclysmic geological events. People reach a gridlock preventing them from pooling their intellectual resources to ward off such problems when they substitute beliefs for knowledge, when faith trumps science.The Watchman's Rattle does not maintain that religiosity is a human disease; she does believe that faith and knowledge can coexist harmoniously to benefit humanity. However, she insists that memes, or widely accepted ways of thinking, undermine creative problem solving based on empirical knowledge. Costa dedicates a chapter to each of the five supermemes she sees plaguing us today: irrational opposition, personalization of blame, counterfeit correlation, silo thinking, and extreme economics. Once any of these supermemes take hold, leading us to cognitive threshold, we tend to disregard data, reject viable solutions, and condemn insight. Opposition substitutes for advocacy and short-term, short-sighted mitigations abound. Fortunately, Watchman's Rattle answers a fourth question with a resounding yes: Can we humans who contributed to these problems be agents in solving them? Costa pleads for a rebalancing of knowledge and beliefs and a restoration in trusting insight. While this may sound like a belief in disguise, it is not. She carefully details the link between insight and wisdom. After all, she is a disciple of biologist Edward O. Wilson and James D. Watson, who both overcame their own silo thinking to resolve their scientific differences. If in this current political climate, not just in the United States but across the globe, there is a more readable, engaging book to show us where the human race now stands, I do not know of it. 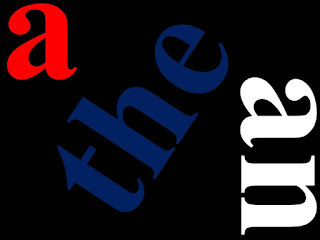 The anomalies of the definite article continue with this post. "I work for Hewlett-Packard" or "I work for HP." "This drug is made by Bristol-Myers Squibb" or "This drug is made by BMS." "I visited the Federal Bureau of Investigation" or "I visited the FBI." "She is a member of the National Association for the Advancement of Colored People" or "She is a member of the NAACP." "Have you gone to the Metropolitan Museum of Art?" but "Have you gone to MMA?" "He attended the University of Southern California" but "He attended USC." DEP must comply with various state and federal laws. Commissioner Raymond Kelly is a 43-year veteran of the NYPD. Why DEP but the NYPD is not easy to explain. Saying "I work for the DEP" sounds strange, yet saying either "I work for the NYPD" or "I work for NYPD" sounds equally acceptable to the native English speaker. As many nonnative speakers tell me, you have to get a feel for the article because knowing the rules alone just won't do.